Dish Network Corporation is a U.S. television provider. Based in Meridian, Colorado, it is the owner of the direct-broadcast satellite provider Dish (stylized DISH, formerly and still commonly known as Dish Network), and the over-the-top IPTV service Sling TV. As of November 2016[update], the company provided services to 13.7 million television and 580,000 broadband subscribers. The company has approximately 17,000 employees. Joseph Clayton became president and chief executive officer of the company in June 2011, while Charlie Ergen remained chairman. Clayton remained in the position until March 31, 2015 when he retired leaving Ergen to resume the post. Ergen has said diversifying and updating technology for the company will be a high priority, with an expectation that, over the coming decade, the company will provide internet, video, and telephone service for both home and mobile applications. In December 2017, Dish Network announced that Ergen will step down and be replaced by Erik Carlson. Dish Network logo from March 4, 1996-April 2000. Dish Network officially began operations on March 4, 1996, as a service of EchoStar. EchoStar, a precursor to Dish Network, was formed in 1980 by its chairman and chief executive officer, Charlie Ergen along with colleagues Candy Ergen and Jim Defranco, as a distributor of C-band satellite television systems. In 1987, EchoStar applied for a direct-broadcast satellite broadcast license with the Federal Communications Commission and was granted access to orbital slot 119° west longitude in 1992. In 1998 EchoStar purchased the broadcasting assets of a satellite broadcasting joint venture of News Corporation and MCI Worldcom, called ASkyB (for American Sky Broadcasting, named after News Corp's BSkyB service in Britain); the two companies had nearly merged (which called for Dish Network being renamed Sky) before it was called off due to Charlie Ergen's clashes with News Corp. executives. With this purchase EchoStar obtained 28 of the 32 transponder licenses in the 110° West orbital slot, more than doubling existing continental United States broadcasting capacity at a value of $682.5 million; some of the other assets were picked up by rival PrimeStar, which was sold to DirecTV in 1999. The acquisition (which also included an uplink center in Gilbert, Arizona) inspired the company to introduce a multi satellite system called Dish 500, theoretically capable of receiving more than 500 channels on one Dish. In the same year, EchoStar, partnering with Bell Canada, launched Dish Network Canada. On December 7, 2007, EchoStar announced that it would spin off its technology and infrastructure assets into a separate company under the EchoStar name, after which the remainder of the company would be renamed Dish Network Corporation. The spun-out EchoStar began trading on January 3, 2008. In 2011, Dish Network spent over $3 billion in acquisitions of companies in bankruptcy, which The Motley Fool's Anders Bylund described as "a veritable buying rampage in the bargain bin." This includes the April 6, 2011, purchase of Blockbuster Inc. in a bankruptcy auction in New York, agreeing to pay $322 million in cash and assume $87 million in liabilities and other obligations for the nationwide video-rental company. Dish Network also acquired the defunct companies DBSD and Terrestar. Dish Network also made a bid to purchase Hulu on October 2011, but Hulu's owners chose not to sell the company. There was also speculation that Dish Network might purchase Sprint Nextel or Clearwire. In 2013, Dish made a bid for both companies. CEO Charles Ergen plans on adding wireless internet and mobile video services[when?] that can compete with Netflix and cable companies. About the new markets, Ergen said, "Given the assets we've been accumulating, I don't think it's hard to see we're moving in a different direction from simply pay-TV, which is a market that's becoming increasingly saturated." Dish Network also plans on offering high-speed internet.[when?] The company plans a hybrid satellite/terrestrial mobile broadband service. In 2011, it petitioned the FCC to combine the S-Band spectrum it acquired from DBSD and Terrestar, and combine this spectrum with LTE. Unlike LightSquared, Dish's spectrum has minimal risk of disrupting Global Positioning Systems. At the 2012 Consumer Electronics Show, Dish Network announced a corporate rebranding, under which the company would publicly refer to itself as just "Dish" rather than "Dish Network". On September 27, 2012, Dish Network announced a satellite broadband service called DishNET, aimed at rural areas. Both a standard receiver and a receiver with built-in digital video recorder (DVR) were available to subscribers. The Dish Network ViP722 HD DVR (Record up to 350 hours of standard-definition (SD), up to 55 hours of high-definition (HD)) replacement to the ViP622 has received generally positive reviews from CNET and others. In January 1999, the company released the industry's first high-definition television (HDTV) tuner. In August 2003, the company launched EchoStar IX, the first satellite equipped with commercial Ka band payload for broadband service over the United States. This led the company in 2004 to be the first satellite TV service to offer local channels to all 50 states. In that year, the company also introduced the nation's first interactive TV multiple picture-in picture application for the Olympic Games, offering coverage from multiple channels at once. This year the company also acquired its ten millionth customer. Dish Network offers different types of satellite receiving equipment for obtaining signals from its diverse satellite fleet. Most of their consumer boxes are manufactured by Sanmina-SCI Corporation to EchoStar specifications. Prior to the December 2001 merger of SCI Systems and Sanmina, Dish Network receivers were produced at factories in Huntsville, Alabama and Fountain, Colorado. Currently,[when?] receiver assembly takes place in Guadalajara, Mexico and India. In spite of all this capacity, EchoStar still needed to fulfill the dream of nationwide high-definition television and conceived the Dish 1000 system to receive signals from 110°W, 119°W, and 129°W orbital locations. Originally, Dish Network high-definition subscribers required two separate satellite dishes. Currently, Dish Network subscribers can receive nationwide HDTV channels using the 129°W orbital location or 61.5°W orbital location. Because of issues with low signal strength, the older model Dish 1000 has been replaced with the Dish 1000.2. The 1000.2 has a 10% larger reflector for better signal strength and an integrated LNB for easier installation. The Dish 1000.2 is 23 in (580 mm) in diameter. Even with the larger size, there are still many reports of customers consistently losing signal on the 129°W orbital location. This has forced some customers to either use a 2nd separate Dish Network brand dish, or an aftermarket 30" dish, aimed specifically at the 129°W orbital location. 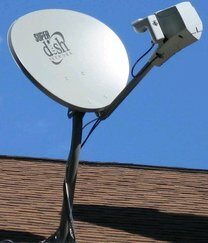 On several satellite related web support forums, customers have critically suggested that the new Dish 1000.2 wasn't nearly large enough and should have been 20–30% larger to properly deal with rain fade. Later Dish Network took the approach of splitting the US into two regions. Subscribers west of Chicago use Dish 1000.2 antennas aimed at the 110°W, 119°W, and 129°W orbital locations (referred to as the western arc). Subscribers east of Chicago use Dish 1000.4 antennas aimed at the 61.5°W, 72°W and 77°W orbital locations (referred to as the eastern arc). Tailgater is a portable satellite antenna; the tailgater can be purchased as a standalone device for $350. The Tailgater is now being supported by a Wally receiver, to replace the still supported 211k model. Customers only need pay for the period of time where the receiver is active on the account, monthly cost for a Vip211k or Wally is $7 per month, if the receiver is the only one on the account, there is no charge. It weighs ten pounds, is protected from weather, and automatically searches for a signal. The only satellites that are currently compatible with the Tailgater are at Dish's 119 (SD/HD TV), 110 (SD/HD TV), and 129 (SD/HD TV) orbital slots. The Wally is a solo-receiver without a built in digital video recorder (DVR). Hopper is a line of multi-tuner set-top boxes first introduced in 2012; they are digital video recorders that can be networked with accompanying "Joey" set-top boxes for multi-room access to recordings. Dish Network subsequently introduced updated versions of the Hopper, including Hopper with Sling (which adds integrated placeshifting capabilities), and the Hopper 3, which features 4K support and 16 tuners. Hopper supports a voice-activated remote, as well as Amazon Echo and Google Home integration. Dish Anywhere is Dish's subscriber-only streaming video service, which includes HBO and Cinemax programming. As of late 2018, HBO and Cinemax are no longer available for Dish customers due to Contract disputes. In May 2012, Dish launched DishWorld, a subscription-based over-the-top streaming IPTV service, as an app on Roku devices, offering access to over 50 international television channels via broadband streaming. Some broadcasters have been hesitant about over-the-top services such as Sling TV, showing concern that they may undermine their carriage deals with larger conventional cable, satellite and Internet TV providers. Time Warner initially noted that the carriage of its channels on the service was only for a "trial" basis, while both Time Warner's CEO Jeffrey Bewkes and an analyst from the firm Macquarie Capital disclosed that current contract language in Dish's OTT carriage deals with the service's content distributors would cap the number of subscribers that the service is allowed to have at any given time to 5 million. Neither Dish Network or its content providers have confirmed any such cap. As of October 2016[update], the service has approximately 1 million subscribers. Most of the satellites used by Dish Network are owned and operated by EchoStar. Since EchoStar frequently moves satellites among its many orbiting slots this list may not be accurate. Refer to Lyngsat and Dish Channel Chart for detailed satellite information. EchoStar I 77 December 28, 1995 Lockheed Martin Astro Space Series 7000 (AS-7000) Can carry a limited number of services on odd numbered transponders. EchoStar is not licensed to serve CONUS customers in the United States from this location but may transmit local stations. EchoStar II 148 September 10, 1996 Ariane 4 On 14 July 2008, EchoStar reported to the SEC that EchoStar II "experienced a substantial failure that appears to have rendered the satellite a total loss". Retired in mid-2008. EchoStar III 61.5 October 5, 1997 Lockheed Martin Missiles and Space A2100AX Replaced by EchoStar XV and was serving as an in-orbit spare. Placed on graveyard orbit by September 6, 2017. EchoStar IV 77 May 8, 1998 Lockheed Martin Missiles and Space A2100AX This satellite had a launch issue, is now in an inclined orbit and is not currently[when?] operational. It largely serves as a placeholder for EchoStar slots. EchoStar V Deorbited from 148 September 23, 1999 Space Systems/Loral FS-1300 EchoStar V was moved from 110 to 129 and finally to 148. International programming at 148 has moved to Anik F3/118.75°. Locals have moved to spot beams at other locations. The satellite was to serve as a placeholder for EchoStar at the 148 slot. The satellite was experiencing stability issues that made signal levels unstable for the short time it was located at 148. On July 31, 2009, all remaining programming at 148 ceased. Factors now indicate discontinuation of the 148 slot, at least for the short term, 3–4 years. EchoStar VI 77 July 14, 2000 Space Systems/Loral FS-1300 Replaces EchoStar VIII. EchoStar VII 119 February 21, 2002 Lockheed Martin Missiles and Space A2100AX Currently[when?] an on orbit spare. Provides Dish Network's spot beam services to the western United States, as well as Muzak programming to businesses on leased bandwidth. EchoStar VIII 77 August 21, 2002 Space Systems/Loral FS-1300 Formerly at 110. On January 30, 2011, the satellite experienced a single event upset and drifted out of its intended orbit, this required all services to be relocated to other available satellite capacity in the Eastern Arc. One week later some services were restored, but the satellite is expected to be taken out of service again and replaced temporarily by EchoStar VI in order to conduct further testing. EchoStar IX / Galaxy 23 121 August 7, 2003 Space Systems/Loral FS-1300 Capacity on this Ku-band satellite is available for lease on a transponder basis. The satellite is jointly owned by EchoStar and Intelsat: Ku band and Ka band payloads owned by EchoStar, C band payload owned by Intelsat and designated Galaxy 23. EchoStar X 110 February 15, 2006 Lockheed Martin Missiles and Space A2100AXS First seen functioning May 2016 in the 110.0W slot and is still transmitting from the same location as of October 2016. EchoStar XII 61.5 July 17, 2003 Lockheed Martin AS-2100 Originally known as Rainbow 1, this satellite was launched by Cablevision/Rainbow DBS and used for the Voom DBS service at 61.5° W until the satellite and transponder licenses were sold to EchoStar in 2005. Renamed EchoStar 12 in March 2006. Currently only used for spot beam capabilities. Echostar XIV 119 March 20, 2010 Space Systems/Loral FS-1300 Replaced Echostar VII. EchoStar XIV launched on an International Launch Services Proton/Breeze M vehicle from the Baikonur Cosmodrome in Kazakhstan. Resides at an altitude of 22,000 miles. Anik F3 118.75 April 12, 2007 Astrium Eurostar 3000 Customers use the 36 inch Dish 500+ or Dish 1000+ to receive this non-DBS, medium-powered signal. Anik F3 is leased by EchoStar from Telesat Canada to serve CONUS customers. It broadcasts on non-DBS FSS frequencies (~11.7-12.2 GHz) using circular polarity (the only satellite serving the United States in this mode). It permanently replaces AMC-16, which was temporarily placed at 118.75° W due to delays in Anik F3 production. AMC-16 moved back to 85° W when Anik F3 was fully operational. A primarily international satellite with international channels once on 61.5, 121, or 148. Ciel-2 129 December 10, 2008 Thales Alenia Space Spacebus-4000C4 Replaced EchoStar V at the 129°W orbital location. Owned by Canadian Ciel Satellite Group, EchoStar leases the entire bandwidth of the Ciel-2 satellite. Provides national HD programming and HD spot beam locals. Nimiq 5 72.7 September 17, 2009 Space Systems/Loral LS-1300 A Canadian satellite operated by Telesat Canada. EchoStar leases the satellite's capacity. Dish Network independent dealers have repeatedly been charged and fined for employing illegal telemarketing tactics, such as violating do not call lists and making calls in which a live telemarketer does not connect promptly after the call is answered. Dish Network terminated agreements with some independent dealers in relation to these charges. In March 2009 the Federal Trade Commission charged Dish Network and two of its dealers with multiple violations of the FTC's Telemarketing Sales Rule and the Telephone Consumer Protection Act of 1991. In 2017 Dish Network was fined $280 million by the FTC for Do Not Call Registry violations. Dish has also begun to collect shipping fees on equipment that needs to be returned after customers cancel their service with Dish. The shipping cost back in September 2014 was $17. As of June 6, 2017, the shipping cost is now $12. This fee applies regardless of whether the fee was included in the initial contract customers signed. Dish has been sued and countersued dozens of times. In fact, Dish uses litigation as a profit center. Charlie Ergen said, "I may be the only CEO who likes to go to depositions. You can live in a bubble, and you're probably not going to get a disease. But you can play in the mud and the dirt, and you're probably not going to get a disease either, because you get immune to it. You pick your poison, and I think we choose to go play in the mud." In 2001, Dish admitted to using over 100 law firms over a ten-year period. Dish fired a wheelchair-bound quadriplegic man, Brandon Coats, from his job as a telephone operator in 2010 for using medical-marijuana during off-work hours. Coats used marijuana to control muscle spasms. His paralysis was due to injuries from a car crash. Coats failed a random drug test. Coats sued claiming that marijuana use was legal and that he was a model employee. Coats suit relied under a Colorado law called the Lawful Off-Duty Activities Statute that prohibits employers from firing employees for doing legal things during their personal time. The trial court and Colorado Court of Appeals ruled in Coats v. Dish Network that since marijuana is banned by federal law it does not qualify as legal activity despite being permitted by state law. The trial court ruled that Coats should have to pay Dish's legal fees; the appeals court overturned this ruling. In April 2005, Rainbow Media and Dish Network entered into a 15-year affiliation agreement whereby EchoStar's Dish Network obtained the right to distribute the Voom channels until 2020 and agreed that it would pay Rainbow Media monthly subscription fees for the life of the agreement. The subscription fees started at $3.25 per subscriber in the first year of the agreement, and were to increase to $6.43 per subscriber by the year 2020. In a separate agreement, EchoStar's Dish obtained a 20% ownership interest in Rainbow Media (the business unit that contained the Voom HD channels) and Rainbow agreed to invest $100 million into the Voom service each year for the first five years of the agreement. As a result, EchoStar's Dish Network announced that they would be adding ten of Voom's original 21 channels to their lineup starting May 1; the remaining channels were added on February 1, 2006. Following the discovery process, the court granted Voom's motion for sanctions. The New York State Supreme Court found that EchoStar's Dish Network "systematically destroyed evidence" in the case and stated that "it is entirely possible that the documents destroyed by EchoStar demonstrated that EchoStar knew all along that there was no breach...and would prove Voom's case." The Judge also stated that he would tell jurors that Dish Network destroyed evidence and that the jury may assume the evidence would have been helpful to Voom's case. According to Sanford C. Bernstein analyst Craig Moffett in a recent Wall Street Journal article, "cases involving spoilation of evidence rarely go to trial because the odds are so skewed against the offending party." In this case, the judge told the jury that EchoStar failed to preserve certain evidence; he barred Dish from calling its expert witness to testify on damages. Additionally, the court stated in its November 3, 2010 ruling: "In conclusion, the court notes EchoStar's pattern of egregious conduct and questionable—and, at times, blatantly improper—litigation tactics. EchoStar's spoliation in this action, and the fact that it has been sanctioned for spoliation in previous actions, is precisely the type of offensive conduct that cannot be tolerated by the court. Similarly egregious is EchoStar's last minute finagling with expert reports, believing that it can play fast and loose with the rules of procedure in order to enhance its litigation posture." The trial commenced on September 19, 2012 in the New York State Supreme Court. During the summer of 2012, financial analysts who cover Dish urged the company to settle the lawsuit in advance of the trial, as "the odds would … appear to be heavily in Cablevision's/AMC's favor." On June 3, 2009, satellite service provider EchoStar was found by Marshall, Texas, federal district court judge David Folsom to be in contempt of a permanent injunction against using some of TiVo's technology and was required to pay the DVR pioneer $103.1 million plus interest. On May 3, 2011, Dish Network Corporation and EchoStar Corporation agreed to pay TiVo Inc. $500 million to settle a dispute over the use of some of TiVo's technology. This lawsuit took more than ten years to resolve. One of the judges involved said that the conduct of Dish's lawyers didn't "even meet law-school student behavior," and "presented the saddest day I have seen in my many years in court." Dish has reportedly been criticized for treating analysts and major shareholders poorly. Craig Moffett, senior analyst of U.S. telecommunications, U.S. cable, and satellite broadcasting at Sanford C. Bernstein once requested time with management to learn about how Dish does business. Ergen told him, "We're too busy creating value around here to sit down and talk about it. Thanks but no thanks." Chris Marangi, a money manager for Gamco Investors, which held about four million shares in Dish, said that the company is very uncooperative. He says that despite traveling to Denver frequently has never been able to get a meeting with Ergen or any other Dish senior manager. "They're probably the least transparent company of any I've ever dealt with." Dish sends out press releases on its earnings deliberately late enough to be of little or no use to analysts and investors, who are then forced to sort through complicated filings submitted to the Securities and Exchange Commission. On May 20, 2012, Dish Network removed Sundance Channel from its channel lineup. Two weeks later on June 4, 2012, Dish relocated AMC, WE tv, and IFC to higher channel positions with AMC being split into two separate standard definition and high definition channel feeds (AMC moved from channel 130 to channel 9609 for the SD feed and 9610 for the HD feed, WE tv moved from channel 128 to channel 9608 and IFC was moved from channel 393 to channel 9607); the former channel lineup spaces occupied by the three channels were, respectively, replaced with HDNet, Style and MoviePlex multiplex channel Indieplex. The move is believed to be in response to an ad run during a June 3 airing of an episode of Mad Men urging Dish Network customers to inform the company to keep the three AMC Networks channels on the satellite provider with Dish stating that the relocated channel positions better reflect the channels' ratings. On October 21, 2012, AMC Networks announced a settlement was reached between them, Cablevision and Dish in which Dish was forced to pay up to $700 million in damages to Cablevision for damages from removing Voom owned channels off the Dish Lineup back in 2008, and in return Dish signed a new agreement to bring the AMC networks owned channels back on the Dish lineup with AMC returning October 21 and the rest on November 1. Also, DISH simultaneously brought back FUSE, and all 4 channels were moved from "America's Top 200" to 120. During a conference call Ergen stated after being asked about the removal of AMC channels, "Our customers are not looking at zombies in New York City. They live in farms and ranches ... We have data, real data from our customers. And for whatever reason, our customers don't watch some of those critically acclaimed channels at the level that we read about in the paper, perhaps because we skew a bit rural or whatever." Ergen also said "I've had satellite television for as long as satellite television has been around, and there's never been one minute that I know of that anybody in my family or anybody who's came to my house has ever watched one second of any of those channels. They have no clue about zombies in New York City marching around saying, 'Where is my AMC?'" Soon after the call, Business Insider blared the headline, "Dish CEO says customers don't care about AMC because they live on 'farms and ranches.'" MSG, a regional sports network serving New York state, was dropped on October 1, 2010. Although MSG shares ownership with Voom and AMC (all three companies being controlled by the Dolan family), it was not included in the 2012 settlement. As of 2017, the carriage dispute has never been resolved, leaving MSG, its sister networks MSG Plus and later addition MSG Western New York, unavailable on the service. On March 3, 2017, at midnight, ET, Dish network has dropped the Hearst Television-owned local stations from their line-up. This includes 32 stations in 28 markets, affiliated with NBC, ABC, CBS, The CW, and MyNetworkTV in cities including Boston, Tampa, Milwaukee, Pittsburgh, and New Orleans. The stations were restored on April 26, 2017, at 7:00 p.m. ET. On October 21, 2014, during the early morning hours, Dish entered a dispute with Time Warner's Turner Broadcasting System. Dish removed CNN, HLN, Cartoon Network/Adult Swim, Boomerang, TruTV, Turner Classic Movies, and CNN en Español as the contract to carry those channels expired on October 20. TBS and TNT were not removed, as they are carried under a different contract. The channels were pulled without warning leaving many with questions. Dish replaced CNN and HLN with MSNBC, replaced Cartoon Network and Boomerang with Nicktoons (except for the West Feed which was replaced by a message about the removal of the channels), replaced Turner Classic Movies with FXM, and replaced TruTV with Esquire Network during the duration of the dispute. The dispute was settled and the affected channels were restored on November 21, 2014. On Monday November 20, 2017 at 11:59 p.m. Eastern, Dish entered a dispute with CBS Corporation. Dish subscribers lost access to CBS Television Stations (which own and operate select CBS and The CW owned-and-operated stations in New York City, Los Angeles, Chicago, Dallas, among 14 other markets) CBS Sports Network and Pop as the contract to carry those channels expired that day. Showtime, The Movie Channel, and Flix were not affected as the premium networks are carried in a different contract. Dish Network claimed in a statement the following day that "CBS chose to black out Dish customers' access to its channels in an effort to raise rates and gain negotiating leverage." However, CBS rebutted those claims on Wednesday November 22, saying that Dish Network is "desperate to retain subscribers" and "clearly, pulling content providers off the air is Dish's way of doing things." Customers in the Los Angeles and Dallas markets were unable to watch the Thanksgiving Day football game between the Los Angeles Chargers and the Dallas Cowboys unless they watched it over-the-air via a DTV antenna. The TV stations and cable channels were restored on November 24, 2017 after a new agreement was reached. This wasn't Dish Network's first blackout with CBS. Back in March 2004, Dish briefly removed all of the original Viacom assets (including CBS and UPN O&O TV affiliates before its 2005 split into CBS Corporation) before reaching a new long-term agreement to restore those services. ^ "Dish Network Corporation Company – Company Overview". Hoover's. ^ a b c d e f g "DISH Network Corporation 2017 Annual Report (Form 10-K)". sec.gov. U.S. Securities and Exchange Commission. February 2018. ^ "DISH Network Corporation Form 10-K" (PDF). Dish Network. February 22, 2017. Archived from the original (PDF) on 2017-03-09. Retrieved 2017-03-08. ^ "Company Info | About DISH". about.dish.com. Retrieved 2016-10-04. ^ "Technical details for satellite ECHOSTAR 1". N2YO.com - Real Time Satellite Tracking and Predictions. Retrieved 2016-10-04. ^ Avery, Greg (16 May 2011). "New Dish Network CEO sees changed company soon". Business Journal. Retrieved August 1, 2011. ^ Wilking, Rick (23 Feb 2015). "Dish Network CEO Joe Clayton stepping down". CNBC. Retrieved 24 May 2015. ^ "Ergen lays out Dish Network's 10-year plan". Boston.com. May 2, 2012. Archived from the original on July 7, 2012. Retrieved May 4, 2012. ^ Johnathan Garber, Business Insider. "Dish Network's CEO is stepping down." Dec 5, 2017. Retrieved Dec 19, 2017. ^ "www.DISHNetwork.com". archive.org. 7 April 2000. Retrieved 4 November 2018. ^ "Early Growth of Dish Network". Archived from the original on July 14, 2011. ^ Hachman, Mark (December 7, 2007). "Echostar to Change Name to DISH, Spin off Set-Tops". PC Magazine. Ziff Davis. Retrieved December 1, 2017. ^ "EchoStar Spinoff Begins Trading". DealBook. The New York Times. Retrieved 2018-06-07. ^ a b c d e Sherman, Alex; Grover, Ronald (October 13, 2011). "A Deeper Dish Network". Bloomberg Businessweek. Retrieved October 14, 2011. ^ Anders Bylund (July 1, 2011). "Is DISH Building the Perfect Beast?". Motley Fool. Retrieved May 4, 2012. ^ Fritz, Ben (April 7, 2011). "Dish Network wins bidding for assets of bankrupt Blockbuster". Los Angeles Times. Retrieved May 2, 2011. ^ Ryan Nakashima (October 14, 2011). "Hulu no longer for sale, owners say". USA Today. Retrieved October 14, 2011. ^ Speculations, Great (September 27, 2011). "Dish Network Looks Ready To Dance With Clearwire or Sprint". Forbes. Retrieved October 14, 2011. ^ Phil Goldstein (August 23, 2011). "Dish's wireless plan unveiled: satellite-terrestrial LTE-Advanced network". Fierce Wireless. Retrieved October 14, 2011. ^ Vuong, Andy (January 10, 2012). "Dish reboots business at the 2012 International Consumer Electronics Show". Denver Post. Retrieved March 21, 2012. ^ Wiziack, Julio (20 March 2013). "TV paga terá novo competidor estrangeiro". Folha de S.Paulo. Folha.com. Retrieved 21 March 2013. ^ "Dish launching satellite broadband service aimed at rural areas on October 1st". The Verge. Retrieved September 27, 2012. ^ "Dish's Current Offered Receivers". DISH. ^ David Katzmaier; John P. Falcone (October 4, 2006). "Dish Network ViP622 HD DVR Digital Video Recorder (DVR) reviews". CNET. Retrieved December 19, 2008. ^ "Dish 300 and 500 Pointing Guide" (PDF). Dish Network. Archived from the original (PDF) on January 17, 2008. Retrieved December 19, 2008. ^ "Channels at 61.5°W". Lyngsat. Archived from the original on December 17, 2008. Retrieved December 19, 2008. ^ "Channels at 148°W". Lyngsat. Archived from the original on December 17, 2008. Retrieved December 19, 2008. ^ "Channels at 110°W". Lyngsat. Archived from the original on December 17, 2008. Retrieved December 19, 2008. ^ "Channels at 119°W". Lyngsat. Archived from the original on December 19, 2008. Retrieved December 19, 2008. ^ http://www.gadgetreview.com/ (2 September 2011). "Dish Network Tailgater Portable Satellite Weighs Just 10lbs". Retrieved 14 August 2016. ^ Hachman, Mark (2011-08-29). "DISH Launches 'Tailgater,' a Robotic Mobile Satellite TV Antenna". PC Magazine. Retrieved 2012-07-12. ^ "Dish Network Hopper". PC Magazine. Retrieved 5 January 2014. ^ "Dish Hopper whole-home DVR review". Engadget. Retrieved 5 January 2014. ^ "Dish Network Hopper With Sling". PC Magazine. Retrieved 5 January 2014. ^ "Dish Network will have 4K this summer for every UHD TV". Engadget. Retrieved 5 January 2015. ^ "CES: Dish makes its 4K play". Multichannel News. Retrieved 5 January 2015. ^ "Dish's Hopper 3 DVR lets you watch four shows at once on your 4K TV". The Verge. Retrieved 1 February 2016. ^ "Dish brings Alexa and multi-room music to Hopper DVRs". Engadget. Retrieved 1 February 2017. ^ "Google Assistant now works with 5,000 smart home devices – TechCrunch". techcrunch.com. Retrieved 2018-06-25. ^ Graeme McMillan, Tech Land." Sorry, Netflix: DishOnline Signs HBO, Cinemax Streaming Content." April 21, 2011. Retrieved April 22, 2011. ^ "DishWorld Launches on Roku". Broadcasting & Cable. Retrieved 5 January 2015. ^ "Dish Adds Food Network, HGTV and Other Scripps Cable Nets to Internet TV Lineup". Variety. Retrieved 5 January 2015. ^ "Dish Unveils Internet Pay-TV Service, Sling TV, Starting at $20 per Month". Variety. Retrieved 5 January 2015. ^ Mike Farrell (January 13, 2015). "Dish Unveils Sling TV". Multichannel News. NewBay Media. Retrieved January 13, 2015. ^ Jeff Berman (January 9, 2015). "Dish Network Doesn't Want Sling TV to Become Too Popular". TheStreet. Retrieved January 13, 2015. ^ "Dish's Sling Seen Passing 1 Million Users in Cord-Cutting Race". Bloomberg.com. Retrieved 2016-10-27. ^ "EchoStar III Satellite Recovered and Retired". ^ "launch of Anik F3". Satnews.com. April 12, 2007. Archived from the original on February 5, 2012. Retrieved April 21, 2012. ^ a b Stelter, Brian (2012-05-16). "A DVR Ad Eraser Causes Tremors at TV Upfronts". The New York Times. Retrieved 2012-06-29. ^ Bauder, David (2012-05-22). "Auto Hop Ad Zapper: Dish's New DVR Feature Has TV Networks Worried". Associated Press. Retrieved 2012-07-17. ^ "DISH Sues Networks in Federal Court". Dish's press release. May 14, 2012. Archived from the original on 2012-05-31. Retrieved 30 June 2012. ^ "Moody's: Dish's Ad-Skipping 'Auto Hop' Could Hurt TV Industry". The Wall Street Journal. Dow Jones Newswires. 2012-05-25. Archived from the original on June 4, 2012. Retrieved 2012-06-29. ^ Flint, Joe (June 6, 2012). "Dish claims broadcaster pulled signals in part because of AutoHop". The Los Angeles Times. Retrieved 7 June 2012. ^ "Because of dispute, DISH customers lose Hastings' KHAS-TV". Lincoln Journal Star. Retrieved 7 June 2012. ^ Flint, Joe (June 14, 2012). "Dish Network and Hoak Media reach new deal". Los Angeles Times. Retrieved 3 July 2012. ^ "Dish Networks chairman Ergen says ad-skipping DVR protects kids from junk food, alcohol ads". Associated Press. June 27, 2012. Archived from the original on December 26, 2018. Retrieved 29 June 2012. ^ Tarr, Greg (2012-06-28). "CEA Supports AutoHop Innovation". TWICE. Archived from the original on 2012-07-04. Retrieved 2012-06-29. ^ "Dish Recorder Snubbed for CNET Award Over CBS Legal Scuffle". Wall Street Journal. Retrieved 11 January 2013. ^ "Dish gives Hopper the award denied to it by CBS". The Verge. Retrieved 18 January 2013. ^ "Dish Network to pay $50,000 for violating state No Call law". May 5, 2005. Archived from the original on December 4, 2008. Retrieved December 19, 2008. ^ Catherine Dominguez (January 13, 2006). "PUC issues warning to Dish Network over do-not-call violations". San Antonio Business Journal. Retrieved December 19, 2008. ^ "FTC Charges Dish Network Marketers with Do Not Call and Abandoned Call Violations". Retrieved December 19, 2008. ^ "FTC Charges Dish Network, Formerly Known as EchoStar, with Multiple Do Not Call Violations". Federal Trade Commission. March 25, 2009. Retrieved May 14, 2009. ^ "Court orders $280 million from Dish Network, largest ever Do Not Call penalty". Federal Trade Commission. 2017-06-08. Retrieved 2018-07-09. ^ "Have A Complaint About Dish Network?". Channel 3000. January 23, 2004. Archived from the original on October 9, 2008. Retrieved December 20, 2008. ^ "Dish Network Goes Back on their Word - Nathaniel McCallum". Archived from the original on 23 November 2014. Retrieved 14 August 2016. ^ a b c d e "Dish Network, the Meanest Company in America". bloomberg.com. 2013-01-03. Retrieved 2016-03-28. ^ Flint, Joe (July 9, 2012). "Networks score in AutoHop fight against Dish". Los Angeles Times. Retrieved July 10, 2012. ^ Fox Broadcasting v. Dish Network , District Court for the Central District of California (hosted by Santa Clara law Digital Commons) (District Court for the Central District of California November 7, 2012). ^ Fox Broadcasting v. Dish Network , United States Court of Appeals for the Ninth Circuit (United States Court of Appeals for the Ninth Circuit July 24, 2013). ^ "Ergen-omics: Charlie Ergen uses federal subsidies for small businesses to turn his billion-dollar Dish Network into a wireless player - Watchdog.org". 4 May 2015. Retrieved 14 August 2016. ^ "Colorado court upholds firing for off-the-job medical marijuana use". 25 April 2013. Retrieved 16 January 2018. ^ "Voom Files Against EchoStar". Inside Satellite TV. 8 June 2008. ^ "Dish Lowers Boom On Rest Of Voom". Multichannel News. 14 May 2008. ^ a b "Dish Lowers Boom On Rest Of Voom". Multichannel News. 2008-05-14. ^ "Dish Network: No Room For Voom". Multichannel News. 2008-05-13. ^ "Rainbow Pulls Plug On Voom HD Service" from Multichannel.com 18 Dec 2008. ^ Linda Moss, "Cablevision replaces Voom suite with premium HD services," from Multichannel News, 21 Jan 2009. ^ a b Van Voris, Bob (24 November 2010). "EchoStar's 'Egregious' Acts in Destroying E-Mail Threaten Court Defense". Bloomberg.net. ^ Ramachandran, Shalini (16 September 2012). "Dolans, Dish Take Old Spat to Court". The Wall Street Journal. ^ Manne, Geoffrey (25 November 2010). "More on EchoStar's Questionable Litigation Tactics". Forbes.com. ^ Frankel, Daniel (11 July 2012). "Dish Facing Doom in Voom Litigation, Analysts Say". PaidContent.org. ^ Seifert, Dan (21 October 2012). "Dish Network and Voom HD settle lawsuit, AMC programming to return as soon as tonight". Retrieved 14 August 2016. ^ Steven Russolillo (May 3, 2011). "Dish, EchoStar Settle TiVo Patent Litigation". The Wall Street Journal. Retrieved May 2, 2011. ^ a b "Dish's spending on ventures tied to Ergen family draws scrutiny". 26 March 2013. Retrieved 16 January 2018. ^ a b Baker, Liana B.; Adegoke, Yinka (May 4, 2012). "CORRECTED: DISH subscribers could lose 'Mad Men' in dispute". Reuters. Archived from the original on May 6, 2012. Retrieved May 4, 2012. ^ Dish Network Kicks AMC Networks Channels To Nosebleed Section Of The Dial, Deadline Hollywood, June 4, 2012. ^ Lawler, Richard (July 1, 2012). "AMC dropped from Dish Network, cuts a new deal to stay on with AT&T U-verse". Engadget. Retrieved 4 July 2012. ^ Blessing, Kelly. "amc-to-stream-breaking-bad-premiere-to-dish-customers". Business Week. Archived from the original on 13 July 2012. Retrieved 16 July 2012. ^ Moraes, Lisa de (12 July 2012). "amc-vs-dish-viacom-vs-directv-brawling-satellite-providers-and-cable-companies-take-different-tactics". The Washington Post. Retrieved 16 July 2012. ^ "News - About DISH". Retrieved 14 August 2016. ^ "Dish Network Says Ranchers, Farmers Don't Care About AMC, So We Asked Real Ranchers, Farmers". 9 August 2012. Retrieved 14 August 2016. ^ "Fox News channels go dark on Dish as contract talks stall". Retrieved 14 August 2016. ^ "Fox News Channel And Dish Ratchet Up War Of Words Over Carriage Talks Stalemate". Retrieved 14 August 2016. ^ "Fox News and Dish Network finally come to terms - Hot Air". 16 January 2015. Retrieved 14 August 2016. ^ "Home". Retrieved 14 August 2016. ^ Andreeva, Nellie (21 October 2014). "CNN Among Several Turner Networks Dropped By Dish In Carriage Dispute". Retrieved 14 August 2016.